“And G’d said: ‘Yahi or, Let there be Light, and there was Light”. She is celebrating her thirty-six years, double “Chai” ( or 18 for “Life” in Hebrew), as a Judaic artist and is dedicating her exhibit YAHI OR: “Let There Be Light” to the life, legacy and light of Rabbi Zalman Schachter-Shalomi, of blessed memory, who encouraged Rabinowitz’s path as Judaic artist on a group trip to Israel in 1986 and continuing thereafter and beyond. 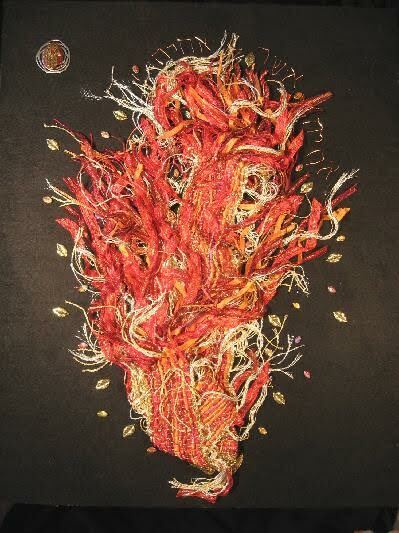 Her artwork, which reflect themes of peace, healing, spiritual journeying, the earth, women of the Torah and life cycle events has been exhibited and is included in numerous museums, including the United Nations; the White House; Spertus Jewish Museum; National Museum of Women in the Arts; University of Judaism, Los Angeles, International Jewish Women’s Research Institute and Gallery at Brandeis University, and the International Sephardic Foundation, Haifa, Israel. Her commissioned work includes Hadassah International President’s Plaque; Women’s League of Bnai Torah Congregation, Boca Raton,FL; the Hillel Organization, U of Cincinatti; The Edgar Bronfman Center, Williams College; Knesset Israel Congregation, Pittsfield, MA; Westchester Reform Temple, White Plains, NY. 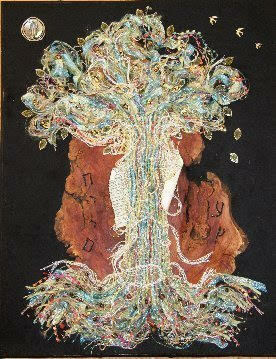 She was a featured artist in the ABC-TV Special documentary “EMBRACING JUDAISM: Looking In, Looking Up, Looking Out”. She is included in the “Who’s Who of American Artists, 1988-2015. Weaving/mixed-media Assemblage, 26″W x 30″L x 3″D.